Professional footballers second main source of income is their individual sponsorships, after the salary they receive from their club. Brands seek to lock down key players with financial incentives and different conditions which makes it unusual to see football stars change their sponsors during their professional career. This does not mean it has not happened but it is the exception to the rule. In the lead up to the World Cup much store is put on the key sponsored players to show case the new range of boots. At the FIFA World Cup TM 2014, the first goal of the tournament was scored by Marcelo Vieira (Brazil), only he netted into own goal. Not that unremarkable, but the captain of Brazil had recently changed his sponsor which put the payer under the spotlight. Playing for Real Madrid he was sponsored by Nike, then at the World Cup 2014 he had become an Adidas player. Was the own goal a serendipitous event, or the revenge of changing sponsors, who knows? 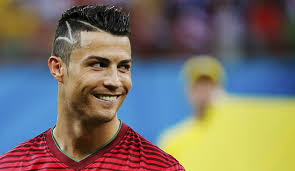 For FIFA World Cup Brazil 2014 Nike signed six of the best players in the world including the top ranking Cristiano Ronaldo (Portugal). Nike also sponsored 10 national teams including: Brazil , England, France, Portugal, Netherlands, Greece, Croatia, USA, Australia , and South Korea . 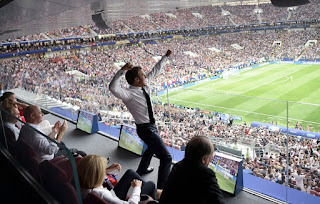 In total, 171 goals (five own goals) were scored by 121 players during the tournament, with 135 goals scored in the first round. In FIFA official records goals scored from penalty shoot-outs are not counted. Sixty-one (61) came from players wearing Nike cleats. Nike's best-performing boot (21 goals and 65 assists) was the Superfly IV as worn by Chile's Alexis Sanchez and Switzerland's Xherdan Shaqiri; Hypervenom 13; Vapour X 10; Magista Obra 7; Tiempo Legend V 6; Vapour9 2; CTR 360 III 1 ; and Magista Opus 1. Brazil's Neymar da Silva Santos Jr., (Neymar) wearing Hypervenom, Nike’s top goal scorer with four goals and Nike’s Miroslav Klose (Germany) netted his 15th World Cup goal to tie for the title of all-time leading World Cup goal scorer. 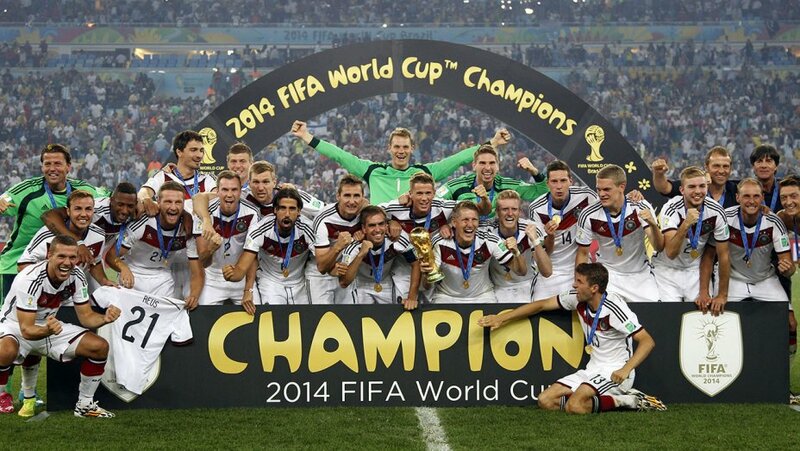 Adidas was the major sponsor of FIFA World Cup Brazil 2014 . 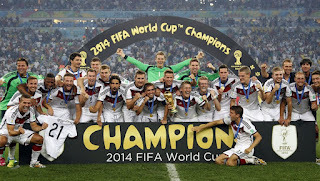 The German Company outfited nine national teams. (including four of the favourite teams i.e. Spain, Germany, Argentina and Colombia.) These were: Argentina, Bosnia and Herzegovina, Colombia, Germany, Japan, Mexico,Nigeria, Russia and Spain. Fifty-seven (57) goals and 54 assists came from the boots of players wearing Adidas cleats. 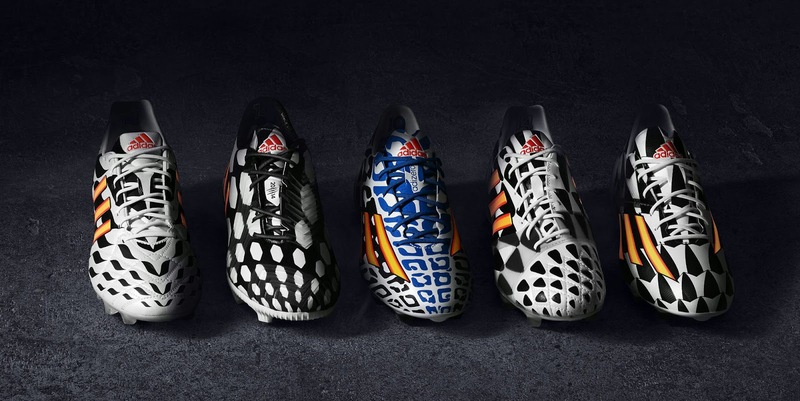 Adizero (38 goals); Predator Instinct (15 goals) ; Nitrocharge BP (3 goals) ; 11Pro TRX (1 goal). Germany's Thomas Müller (5 goals) and Argentina's Messi (4) wore Adizero to become the top scorers for the three stripes. James Rodríguez (Colombia), was awarded the Golden Boot for scoring six goals wearing Adizero boots. Puma-sponsored players scored eight goals with six assists. Evopower 1 (6 goals) and Evospeed 1.2 (2 goals) . Puma unveiled novel colourful versions of Pumas’s evoPOWER and evoSPEED football boots, with the right boot in pink and the left boot in blue. Goal scorers wearing the Tricks boot included Ghanaian captain Asamoah Gyan with two goals; and one goal each to Mario Balotelli (Italy) was paid an estimated $6.9 million to wear one blue and one pink Puma cleat and went on to head Italy's winning goal against England. Others included: Olivier Giroud (France), Vedad Ibisevic . Oribe Peralta , Rafik Halliche , and Diego Godin . Best of the rest. Tim Cahill (Australia) wore Warrior Superheat soccer cleats when he volleyed a screamer into the net of the Netherlands. The two Brazilian Goal Keepers: Júlio César and Jefferson de Oliveira Galvão (aka Jefferson) wore ASICS soccer boots during the FIFA World Cup Brazil 2014.